Period quotas allow you to set posting limitations based on time periods. You can decide how many posts can your consultants make to a particular board within specified period boundaries. Each post and post update consume the amount of credits based on the post duration. To set-up period quotas for any of your boards, please follow the instructions below. Click "Job Board & Quotas". Click "Set Board Quotas" tab. Select the board you wish to set the quotas for. New options will appear as you select them. 5c. Choose what happens with the unused quotas - whether they carry over to next period or not. Click "Show Users" Button. By default only Offices/Teams are displayed. Assign quotas. 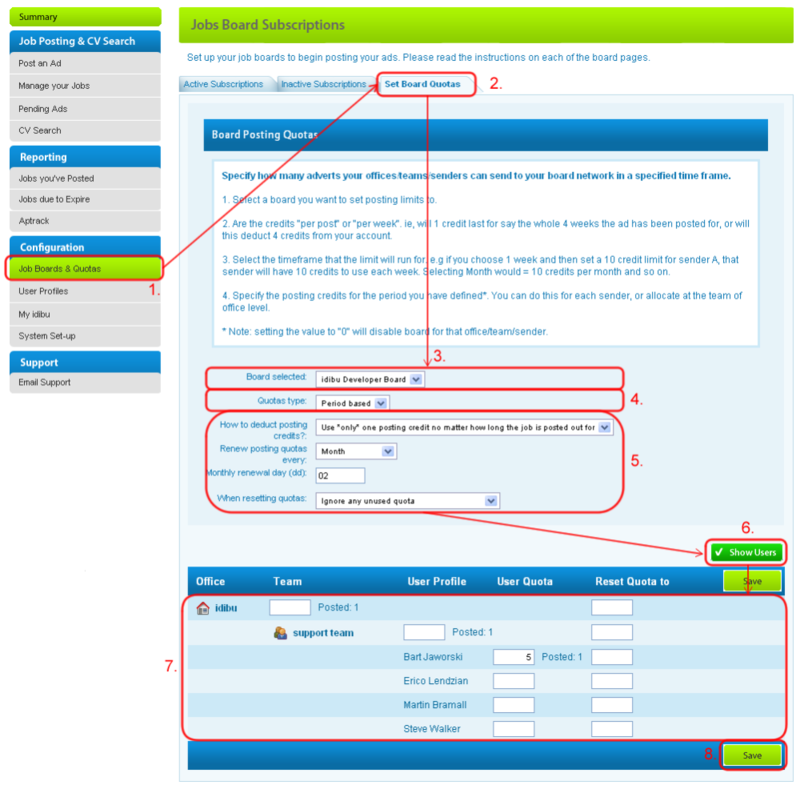 You can assign the maximum posting number to you offices, teams and particular consultants. Please mind that setting "0" as quota prevents access to the board. This field enables you to make current quotas temporary and allow them to refresh to the "Reset quota to" value at the beginning of the next quota period. The admin can reorganise at the quotas and give Consultant 1 a number of (let's say 15) of Consultant 2's quota. This would mean that Consultant 1's quota would show 35 credits, and Consultant 2's would now only show 5. If both consultants have their "Reset Quota to" set to 20, in December the Admin doesn't have to worry about relocating the credits back - they will automatically reset to 20 for both consultants.